IPOB: BIAFRANS VOWS- "WE ARE NO LONGER INTERESTED IN NIGERIA POLITICS, WE'VE TOTALLY REJECTED NIGERIA"
It has come to the notice of Biafrans all over the world as a rude shock, a publication made by Nigeria brown envelop media outlets, asserting that Biafrans have made a U-turn on their unshakable demand for the restoration of Biafra and have instead embraced back Nigeria politics, which they had rejected a long ago. According to the seditious news publication which was made by Naij.com, it said that Biafrans have also adopted an obscure political party called UPP, a party single-handedly owned by Chief Chekwas Okorie as platform to elect Biafrans into political offices in the government of Nigeria. As it is now, Biafrans are not surprised at this final desperate approach of idea from Nigeria government to stop Biafra restoration through political propaganda, lies and blackmail as published by Naij.com, because it did not start today, and we are not expecting an end to it until Biafra is restored. Biafrans are aware that Nigeria government has now run out of new ideas and thereby want to use the present political bubble in Biafraland and this year's election in Anambra state to once again test the resolve of Biafrans on their stand for Biafra restoration. Well, Biafrans are actually ready to always tell the world at all times that they have rejected Nigeria and everything in it. 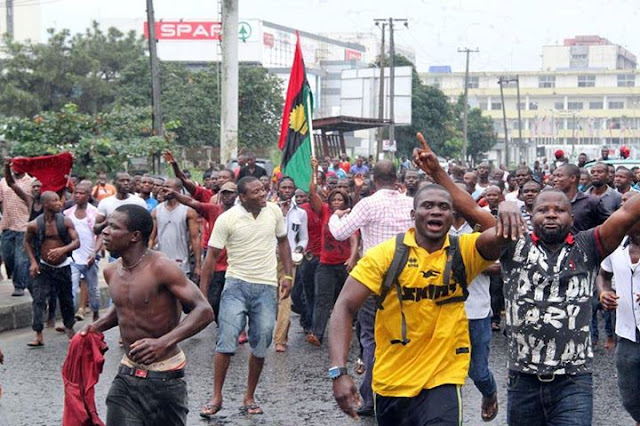 It has not gone unnoticed to Biafrans all over the world that Nigeria government, in its final desperate effort to use the current roaring torrents of political bubble in Biafraland, especially Anambra state to cause confusion to gullible and poorly informed Biafrans, other Nigerians and the world at large on the true political position of all Biafrans. Biafrans are aware that Nigeria government is running from pillar to post gathering all the Biafran prodigal sons like Chief Chekwas Okorie, Dr Orji Uzor Kalu, Chief Emmanuel Iwuanyanwu, Alhaji Rochas Idris Okorocha, Mr Peter Obi, Sen Ken Nnamani and many others as willing tools in their attempt to drag Biafrans back into the Nigeria politics. As Biafrans have rejected these political prodigal sons led by Chekwas Okorie and their political organization called MOBIN (Movement Of Biafrans In Nigeria), as well as their obscure political party called UPP, they have now resorted to media propaganda using the money budgeted for them by Nigeria government to pay Naij.com to do the bidding of their slave masters. Nevertheless, Biafrans are by this publication telling the world once again that they are no more interested in Nigeria and everything associated with it, including its political affairs and association. The only time Biafrans will come out en masse to vote is whenever a referendum to decide the political future of Biafra territory is conducted. Apart from that, count Biafrans out of any more election or political association in Nigeria. We are noble people that can never go back to our vomit as we have completely vomited Nigeria and its politics totally to the mud. Biafrans want to make it clear that nothing any more on earth, not even another genocidal war which is being perpetrated against us, or the economic strangulation or property confiscation imposed on us, or another territorial blockade from the world, as our fathers experienced from 1966-70s, can make Biafrans of this generation to dump Biafra restoration as far a single Biafran is still alive on earth. Media propaganda is not anything to us anymore. Biafrans are by this publication saying "CAVEAT EMPTOR" to MOBIN, UPP party, Chekwas Okorie and his team of political predators looking for gullible Biafrans to devour as cheap prey. Biafra restoration is not for SALE no matter the bargaining price of the highest bidder. Biafrans are also by this publication issuing a disclaimer notice to the world against Chekwas Okorie, MOBIN, UPP and his political predators that we have not send them for any political association in Nigeria on our behalf. Any political transaction with them is not in the interest of Biafrans. This is a disclosure made by Biafrans all over the land as Family Writers Press journalists went around and conducted interview with Biafrans who vowed to boycott any election conducted by Nigeria in Biafraland. It is on this note that Indigenous People of Biafra (IPOB) under Nnamdi Kanu welcomed the stand of the majority of Biafrans as they resolutely vowed to stay away from Nigeria politics until Biafra referendum is conducted. IPOB is saying "Kudos" to all Biafrans for this unanimous resolution as IPOB will always articulately spell out guidelines and framework towards the restoration of Biafra. No Nigeria politician is interested in Biafra restoration, Chekwas Okorie inclusive. If anybody is not interested in Biafra restoration, the person is an enemy to us and our descendants. Let us say "NO" to any stomach infrastructure that will keep us in slavery in Nigeria. A word is enough for the wise!